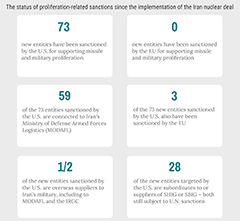 The January 12 sanctions waivers were accompanied by another round of U.S. Treasury Department sanctions, including against entities supporting Iran’s military-related procurement. Earlier in January, the Treasury Department designated five entities for their support of Iran’s solid fuel ballistic missile program. These are the latest in a string of recent actions by the United States against Iranian missile proliferators, which have been taken in conjunction with sanctions targeting the Iranian government’s support for terrorism, human rights abuses, and its destabilizing regional actions. The ongoing effort by the United States to identify and designate entities and suppliers supporting Iran’s missile program stands in contrast to the European Union, which has not sanctioned any Iran-related entities of proliferation concern since December 22, 2012. While neither the United States nor the EU designated any entities during the height of the nuclear negotiations in 2015, the United States resumed such designations in January 2016 – just one day after the implementation of the nuclear agreement. Since the agreement’s implementation, the United States has designated 73 proliferation-related entities, only three of which appear on the EU list. (These entities are listed in appendix to this report.) The majority of these entities are derivative designations targeting subsidiaries and overseas networks of suppliers, front companies, and individuals acting on behalf of already designated entities. Most were targeted for supporting Iran’s ballistic missile program, with a fewer number designated for supporting Iran’s military, including through illicit procurement. Congress, too, has called for greater cooperation between the United States and the EU in efforts to constrain Iran’s missile development, including by coordinating proliferation designations. Such coordination was one reason for the high impact of international sanctions in the period before the 2015 nuclear agreement. The Countering America’s Adversaries Through Sanctions Act (CAATSA – P.L. 115-44), which the president signed into law last August, requires the administration to report to Congress every 180 days on the discrepancies between U.S. and EU WMD or missile proliferation sanctions. The first such report is due at the end of this month. While a number of EU member countries agree on the need to confront Iran’s missile program, all are critical of the president’s decision to tie such action to the nuclear agreement. EU foreign affairs chief Federica Mogherini repeatedly has emphasized the need to address ballistic missiles outside of the nuclear agreement, including at meetings with U.S. officials in Washington last fall. The EU, too, has sanctioned all of the well-known proliferators named above through a series of Council decisions and regulations since 2007. Like the U.S. Executive Order, these authorities provide that the sanctions – including an asset freeze and prohibition on transactions – apply to those entities acting on behalf of, or owned or controlled by, those that are explicitly designated. However, the EU has failed to take action against such related entities since the nuclear agreement’s implementation. This makes it easier for Iran’s missile supply network to continue operating and undermines the impact of U.S. sanctions. SHIG is responsible for Iran’s liquid-fueled ballistic missile program, including the development of the medium-range Shahab-3 originally based on North Korea’s No Dong missile. SHIG also has engaged in the transfer of controlled missile technology with North Korea. SBIG is responsible for Iran’s solid-fueled ballistic missile program and produces Iran’s Fateh-100 short-range missile. Twenty-eight of the 73 entities designated by the United States are subordinates or suppliers to SHIG or SBIG, both of which remain subject to U.N. sanctions pursuant to Security Council resolution 2231. The U.S. focus on SBIG and SHIG increased after Iranian-backed Houthi militants in Yemen launched short-range ballistic missiles into Saudi Arabia on three separate occasions between July and December 2017. During a press conference on December 14, U.S. Ambassador to the United Nations Nikki Haley presented missile parts recovered from two of these missile strikes. One piece of missile debris was stamped with the SBIG logo and a missile guidance system component was imprinted with SHIG’s name. A U.N. investigative panel for Yemen reportedly stated that Iran may be in “noncompliance” with U.N. resolutions by failing to prevent the Houthis from acquiring the missiles. Stamped logos for SHIG and SBIG appear on debris from Iranian missiles fired into Saudi Arabia from Yemen. Photos by EJ Hersom and courtesy of the Defense Video Imagery Distribution System. The United States has continued to target subsidiaries of SHIG and SBIG, most recently on January 4, when the Treasury Department designated five entities for their role in developing and producing missile guidance systems, propellant for solid-fueled ballistic missiles, and ballistic missile launchers. All five are “owned or controlled” by SBIG. U.S. sanctions also have aimed to shut down the overseas supply networks used by SHIG and SBIG. For example, in February 2017 the Treasury Department designated a key Iranian procurement agent, Abdollah Asgharzadeh, and a network of China-based brokers and companies used by Asgharzadeh to procure dual-use technology for SHIG. The Asgharzadeh network procured and shipped foreign-produced ball bearings required for the Shahab-2 and Shahab-3 ballistic missiles. Also in February 2017, the Treasury Department targeted a Dubai-based procurement network supplying SBIG with ballistic missile components. SEI produces electronic equipment for the Iranian military, including radars, avionics and control systems, and missile guidance technology. The firm has used front companies and individuals globally to obtain sensitive U.S.-origin missile-related goods and technology. Half of the 28 foreign firms sanctioned by the United States for proliferation since the nuclear agreement’s implementation were targeted for their support of SEI or its parent, IEI. For example, in July 2017, the Treasury Department designated a China-based procurement agent and a network of Chinese companies she used to procure U.S.-, Canadian-, and European-origin electronic components on behalf of SEI. And in May 2017, the Treasury Department designated another Chinese national and three associated China-based companies for supplying SEI with goods and technology used for missile navigation, guidance, and stabilization. Some transactions have taken place “since at least 2015,” the year of the nuclear agreement. In the Treasury Department’s most recent action on January 12, yet another China-based supply network was sanctioned for selling specialized sensors and navigational gyrocompasses to SEI. Equipment and electronic components for anti-tank missiles with SEI and IEI logos, seized while en route from Iran to Yemen. Photos courtesy of the United Nations. SEI and IEI also have been connected to military-related exports to Yemen. In January 2016, a U.N. investigative panel concluded that weapons seized by the U.S. and Australia while en route to Yemen were likely of Iranian origin. The panel’s report noted that the weapons bore “the markings bearing the names of Iranian industrial companies” and contained photos revealing stamps belonging to SEI and IEI. Since the implementation of the nuclear agreement, the EU has failed to join the United States in identifying and targeting organizations and individuals under the umbrella of entities responsible for Iran’s missile development, production, and export. More broadly, the EU has rarely pursued the overseas networks supplying missile technology to these entities. As a result, SHIG, SBIG, SEI, and others are able to circumvent sanctions more easily by using subordinates, front companies, and overseas agents to support missile development. There are several reasons for this failure to act. First, establishing consensus among the EU’s 28 member countries is difficult. France has taken a firm stance, calling Iran’s missile program “inconsistent” with U.N. resolutions and “a destabilizing factor in the region.” In a speech on January 8, President Emmanuel Macron noted that Iran’s “ballistic missile activity has been stepped up” since the 2015 nuclear agreement, and that dialogue with Iran to restrict this activity is “essential.” Other countries, however, have been less forceful in calling for action. Second, the EU is concerned that any punitive action against Iran’s missile program could further undermine the nuclear agreement, which they judge as already in jeopardy as a result of the U.S. administration’s actions. In remarks last November, Mogherini said that the EU was “ready to addresses other issues,” including missiles, “once it is very clear that the nuclear deal implementation is preserved by all sides [in] full.” However, the nuclear agreement and Iran’s ballistic missile program are linked; both are part of U.N. Security Council resolution 2231, which endorsed the agreement and imposed restrictions on Iran’s missile and military activities. Finally, the EU has faced legal challenges to its designations in recent years. Some Iranian companies and individuals have disputed their designation in EU courts, and have had sanctions against them lifted because the information used to support the designation was confidential. Such information could not be shared openly in court and with the defendants. This may have increased the evidentiary burden required for the EU to issue additional autonomous designations, including derivative designations against subordinates and suppliers of sanctioned entities. Recent statements by U.S. and EU officials indicate a desire to work together to address the threats posed by Iran that the nuclear agreement did not contain, including Iran’s ballistic missile program. During a visit to London this week, U.S. Secretary of State Rex Tillerson announced that a working group had been set up with France, Germany, and the United Kingdom to discuss these threats and “how we might approach Iran to address our concerns.” According to Tillerson, working group participants have been named and the group could meet as early as next week. In addition, French Foreign Minister Jean-Yves Le Drian will be traveling to Iran in early March to discuss Iran’s missile program along with related “regional questions.” He promised to deliver a “frank message” about the need for Iran to contain its missile program as required by resolution 2231. Finally, Germany reportedly is advocating for targeted EU economic sanctions aimed at punishing Iran’s missile program. If Iran refuses to curb its missile development through negotiations, a package of such sanctions reportedly may be adopted. These are welcome developments. 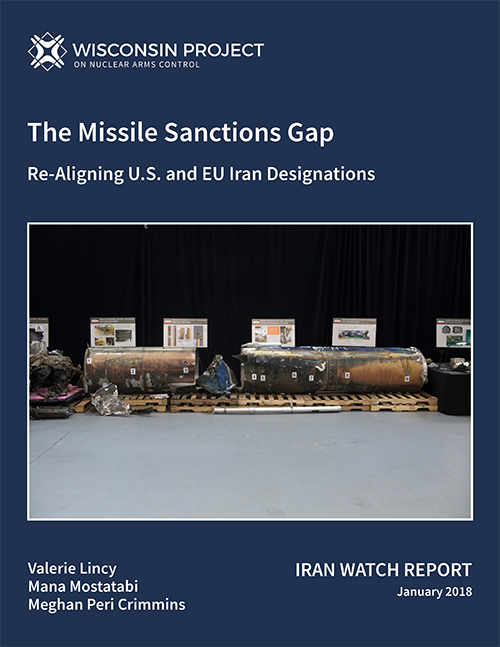 Closer collaboration between the United States and Europe increases the prospect of meaningfully restricting Iran’s missile work, whether through negotiation, economic pressure, or both. “European Union Restrictive Measures (sanctions) in Force,” European Commission, August 4, 2017. (https://eeas.europa.eu/sites/eeas/files/restrictive_measures-2017-08-04.pdf); “European Union Consolidated Financial Sanctions List,” European Commission, January 12, 2018. (PDF download: https://webgate.ec.europa.eu/europeaid/fsd/fsf/public/files/pdfFullSanctionsList/content?token=dG9rZW4tMjAxNw); several entities previously designated for proliferation were re-designated by the EU after 2012, following unsuccessful legal appeals, including Sharif University of Technology. “The List established and maintained pursuant to Security Council res. 2231 (2015),” United Nations Security Council, 2015. (https://scsanctions.un.org/en/?keywords=iran). “Berlin Supports New Iran Sanctions – German Government to Accommodate Trump to Rescue Nuclear Deal,” Der Spiegel, January 20, 2018.